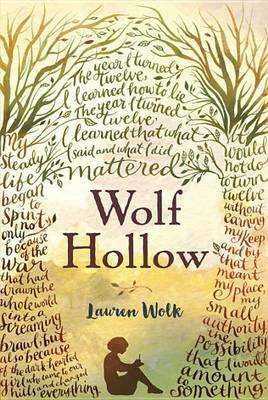 Wolf Hollow is Lauren Wolk's debut novel and it's a masterpiece. Sensitively exploring the uncomfortable subjects of prejudice and injustice, it well and truly deserves the comparisons that are being made to Harper Lee's classic, To Kill a Mockingbird. Annabelle has lived in Wolf Hollow all her life. It's a quiet country community that has seen the impact of two world wars and the Great Depression. Annabelle's family is one of the luckier ones. They're not well off but they don't struggle as much as some of the other families, and they're always quick to lend a helping hand. One of those people to whom they offer quiet support is Toby. A gentle loner and veteran of World War I, he lives in the hills, taking only what he needs from the land, bothering no one. Noticing his interest in photography, Annabelle's mother has given him a camera that she won in a competition and arranges for his photographs to be developed (free of charge as part of her prize). She also leaves the occasional pie under a tree for him to supplement his meagre food supply. It's a life of routine and harmony that changes only with the demands of the changing seasons. Then Betty Glengarry arrives. Cruel and manipulative, Betty seems determined to cause trouble just for the sake of it. She's unlike anyone Annabelle has met before and it's not long before she sparks a series of events that will tear apart Wolf Hollow and see Annabelle stand as a lone voice of justice against a community blinded by prejudice and fear. This is an exquisitely written book. From the opening line — The year I turned twelve, I learned how to lie — I was drawn into Annabelle's world, and 291 pages later I reluctantly left it. Toby is a poignant example of the effects of war on the people who serve. He also reminds us that it can be very easy to judge people despite having no idea of their real story — and not everyone in that situation is lucky enough to have an Annabelle to defend them. Gripping, heart-breaking, thought-provoking, profoundly moving and ultimately uplifting, Wolf Hollow is a book that I know I will read again.